The 13th Moon phase is called Pradosham, a karma-removing time. When Pradosham occurs on a Tuesday it is known as Runa Vimochana Pradosham. It has the special quality of dissolving negative debt karma. Negative financial karma can result in the strain of debts. When you get rid of the stress of debts, you clear a path for prosperity in your life. As your mind and body are purged of the draining energies that are creating suffering for you, positive energies can rush into the channels of your mind and body as you invoke them. The rituals of Runa Vimochana Pradosham bring grace that clears your life of negative debt karmas. The debt-clearing, benevolent energies released during Runa Vimochana Pradosham can clean up a financial mess and help you find a positive way forward. Runa Vimochana Pradosham is a special day on which the energies of this day are aligned in such a way that one who does the specific mantras and prayers gets freed from their debts of life. How does Debt (Runa) Happen? “Runa” in Sanskrit means “debt.” “Vimochana” means “to free from.” Vedic wisdom emphasizes that we are born on this planet to reap the fruits of our actions. Hence, Earth is referred to as Karma Bhoomi, or the planet of action. The nature of our actions decides if they will yield good or bad results. It is not practically possible to do actions that will give only good results to everyone, but we can deliberately avoid harmful activities, reduce selfish activities, and increase selfless activities. Scriptures mention that the benchmark of any activity is not to do anything that you will not want others to do to you. This self-analysis during any action will prevent selfish and harmful activities, thus reducing our individual karma baggage. What are the various debts of life? We are all indebted to our parents, society, environment, etc. Whatever has been taken should be given back. This is the law of the universe. Following are the debts that we incur by being born on Earth and that need repayment. We are made of the gross as well as subtle elements. Our body is the result of the accumulation of food from the earth, the heat and light from the sun, the air, and the water, all taken from the nature. How to repay Deva Runa? Preserving nature; increasing awareness and encouraging more and more people to conserve nature. Minimize or avoid activities leading to any type of pollution. Conserve, water, electricity, paper, etc. Apart from the primary objective of providing food, we use plants and plant products for extensive commercial purposes to the level of their extinction. The same is the case with animals, where we even remove them from their natural habitat for our enjoyment and commercial interests. How to repay Bhuta Runa? Do not indulge in any activity that will inflict pain and suffering to animals. Treat them kindly and with gratitude. We are nothing but a physical extension of our parents. We owe our physical traits to them and to our ancestors. Our skills and talents are also attributes from them that have been transmitted through genes. Just as the animals, we human beings require care and nurturing up to an age where we can be independent to take care of ourselves. How to repay Pitru Runa? Do not hurt the feelings of your parents. Utilize every opportunity to help or take care of old people and children. Be gentle and polite to them. Donate your time, effort, or money in whatever possible way to old-age homes, orphanages, etc. Above all, perform the ancestral rites without fail. People from various occupations and services help us in our daily lives, be it farmers, masons, weavers, carpenters, mechanics, or police. Our family members and friends give us psychological support when needed. Though some services are returned by money, the care and concern of the service providers cannot be underestimated or written off. How to repay Manushya Runa? Treat them with due respect. Donate towards relief work and social causes. Donate your time, money, and effort towards the development of the underprivileged. We are what we are because of our cultural and scientific heritage: that we have learned from our spiritual masters and academic teachers. Creators of every medium of transmission of knowledge and refined culture are gurus in their own ways, for instance, authors of good books or creators of good videos and movies. Humanity is indebted to them for life. How to repay Rishi Runa? Educate yourself well, not only academically, but also culturally. Donate to schools and educational activities. Learn, propagate, or patronize any form of good art. Paying back by means of the above listed activities brings down your debt balance. It is absolutely okay to overpay, because it gets credited into your satkarma (good action) account and also pays rich dividends not only for you, but for generations to come. Remember: What we sow, so we reap, many times over. 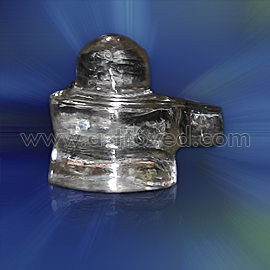 The medium-sized crystal Shiva Lingam will be energized in the Runa Vimochana Pradosham rituals. 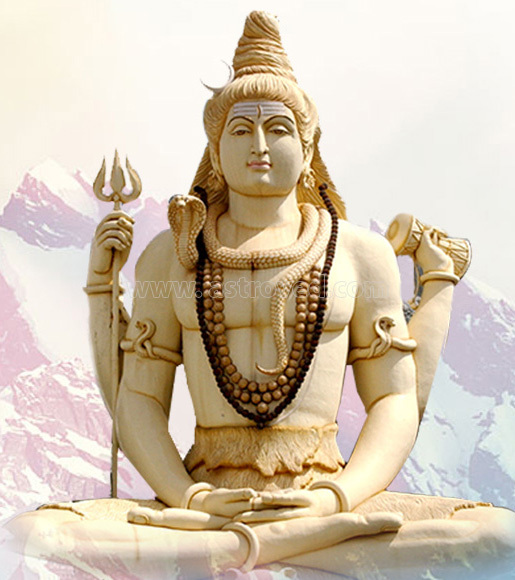 Lord Shiva is conceived in his unborn, invisible form as the Shiva Lingam. The Lingam represents the male creative energy of Shiva, or cause, and is worshipped as the Supreme Consciousness or Highest Intelligence. An Anointing/Hydration Ritual/Abishekam to the Shiva Lingam performed at special times helps dissolve your karma. Please Note:Your energized medium sized crystal Shiva Lingam and Prasad will be shipped from Chennai, Tamil Nadu. Please allow 2 – 4 weeks for delivery after the entire set of rituals is performed. Participate in the Essential Rituals for Debt Removal Pradosham. The Pradosham rituals can be helpful to clear your bad karma and bring lucrative opportunities in life. 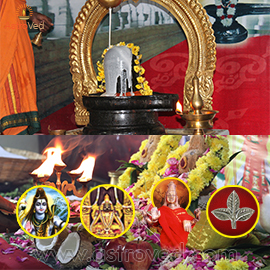 Karma-Diffusing 13th Moon Hydration Solution ceremony to Shiva and sacred bull of Shiva by chanting Laghunyasam Rudra Prasnam and Chamaka Prasnam at the AstroVed fire lab and Remedy Center Runa Vimochana Pradosham day. Laghunyasam is the short form of Mahanyasam, which means ‘Great Purification’. It is a set of Vedic mantras recited to purify mind, body and soul before performing Rudra Abishekam (hydration ritual). A bilva leaf archana to Shiva chanting Rudra Trishati (300 names of Rudra) will also be performed on . Rudra Trishati Archana is a sound and light ritual performed to Archetype Rudra using the verses from Sri Rudram. It is the only form of Archana to Rudra (Shiva) mentioned in the Vedas. The highlight of this Archana is the 300 Bilva leaf offering to Rudra. The most terrible karma is destroyed when a Bilva leaf is offered to Lord Shiva. 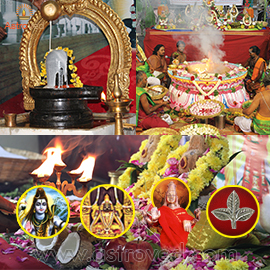 Participate in the Enhanced Rituals for Debt Removal Pradosham. The Pradosham rituals can be helpful to clear your bad karma and bring lucrative opportunities in life. A bilva leaf archana to Shiva chanting Rudra Trishati (300 names of Rudra) will also be performed on . Rudra Trishati Archana is a sound and light ritual performed to Archetype Rudra using the verses from Sri Rudram. It is the only form of Archana to Rudra (Shiva) mentioned in the Vedas. The highlight of this Archana is the 300 Bilva leaves offering to Rudra. The most terrible karma is destroyed when a Bilva leaf is offered to Lord Shiva. 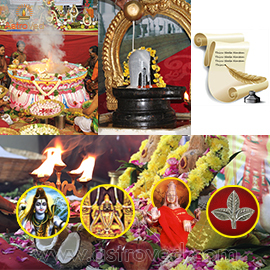 Participate in the Elite Rituals for Debt Removal Pradosham. The Pradosham rituals can be helpful to clear your bad karma and bring lucrative opportunities in life.